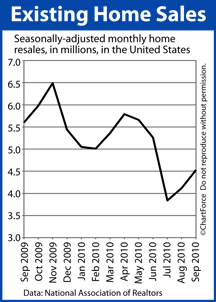 After two months of surging sales, home resales fell by 100,000 units last month to 4.4 million homes nationwide. October’s Existing Home Sales tally is slightly below the report’s 6-month rolling average, according to the National Association of REALTORS® — a time span which includes this year’s $8,000 federal home buyer tax credit’s tail end. 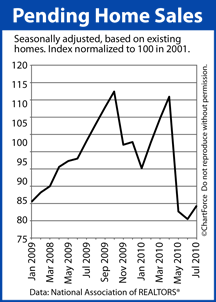 Housing statistics have been wildly inconsistent during that period. For the future of housing markets, though, it’s encouraging that first-time and investment property buyers were both outnumbered by “move-up” buyers; buyers that have sold their respective homes in favor of larger ones. It’s the move-up buyers that power housing. 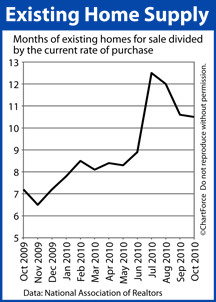 As a point of comparison, first-timers represented 50 percent of all purchases in October 2009. 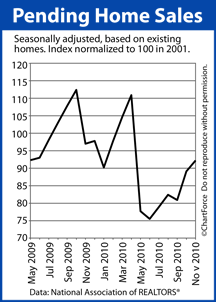 For home buyers, October’s Existing Home Sales report is neither weak nor strong. 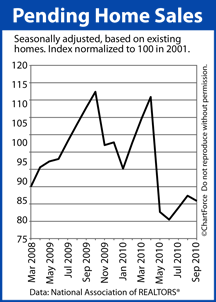 It signals that, with mortgage rates low and home affordability high, housing may be reaching some form of balance. Because — although home sales are down — home supplies are down, too. 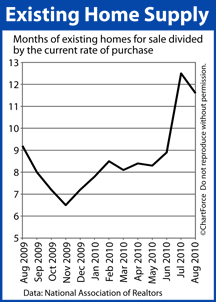 We can infer that buyers outnumber sellers, but probably not by much. In most areas, negotiation leverage is still up for grabs. 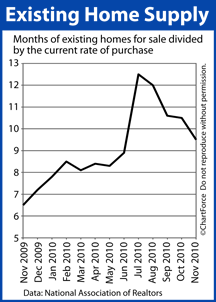 At the current pace of sales, the complete housing stock would be depleted in 10.6 months. “Deals” were in ample supply this summer and eager home buyers snatched them up. For home buyers, September’s Existing Home Sales report foreshadows a more competitive housing market through the New Year. In addition to rising sales volume, home supplies are down by nearly 2 months from July. The number of home resales plunged by 1.4 million units in July, according to the National Association of Realtors®’ Existing Home Sales report. 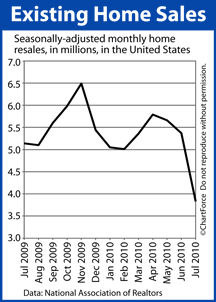 It’s a drop of 27 percent from June; single-family home resales are at the report’s lowest levels since May 1999. That’s over 11 years ago. For investors, it is a good news / bad news scenario: Good news that buying is even easier. Bad news that selling is harder after you have rehabbed. And when you are calculating your ARV, you have to assume that price pressure will continue to move prices lower. 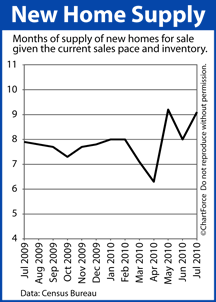 Furthermore, because of the sharp drop in sales volume, home inventories are spiking, which also moves prices down. Homes for sale nationwide fell just short of 4 million units in July and, at the current sales paces, it would take 12.5 months for the existing inventory to be absorbed. Home supply was just 8.9 months in June. In Massachusetts, several counties we work in saw decreases of 30% and even more. For home sellers , the Existing Home Sales report is a bit of bad news. Fewer sales and larger inventories put negotiation leverage in the hands of the buyers which, in turn, creates downward pressure on home prices. It may also increase time-on-market. For home buyers, however, the data is decidedly welcome. After a stimulus-driven spring buying season that favored sellers, the summer and early-fall market seem to favor buyers. More choices and more leverage is a positive. It helps that home affordability is up, too. Although there’s reports that home values are rising, their modest gains are more than countered by the ongoing rally in mortgage rates. Freddie Mac says that 30-year fixed rate mortgage rates are at their lowest levels in history and, at today’s rates, every one-eighth drop in mortgage rates roughly offsets a 1.5% increase to home price. Mortgage rates are down 0.75 percent since mid-April.